The Oxford Dictionary defines “enchanting” as “delightfully charming or attractive”. Well, Verona is all of these. 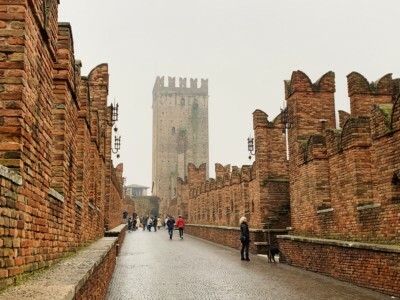 A small, pretty, medieval city, with cobbled streets that lead you to its handful of must-see attractions, it’s hard not to come away without finding something to love. The main centre is not that big. I therefore found that the best way to see everything was on foot (there are hop-on hop-off buses, but I visited out of season when they were not running); even at a leisured pace, you can easily see most things within a couple of days, making this a perfect destination for a weekend break. 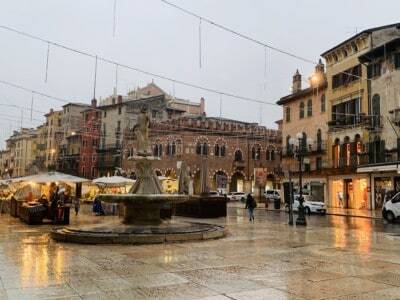 Begin at Piazza Bra and the heart of Verona with the Roman Arena sitting majestically in the centre of the square. 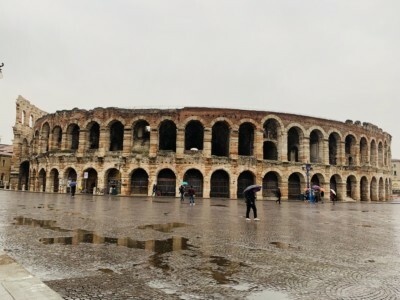 Built in the 1stCentury AD, it predates the Coliseum in Rome and even now hosts massive concerts for up to 15,000 people (in its early life, the capacity was apparently double this). You can enter the Arena for €10. 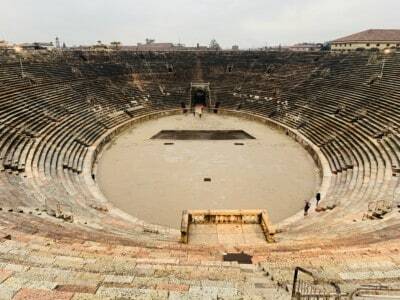 This is worth doing to get a sense of its scale and to appreciate the wonderful acoustics that has made it such an important entertainment venue throughout the centuries (every August and September the city hosts an opera festival). Just shout across the Arena to hear the echo of your voice bounce back. If you feel fit enough, climb to the top of the auditorium and look back down into the stadium and imagine what it must be like when its full…quite something I would think. 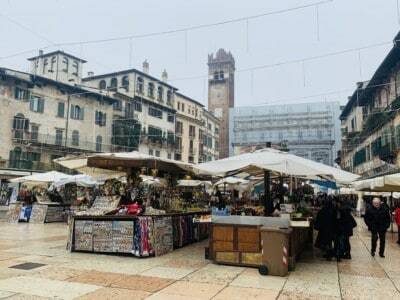 Piazza Bra has a few cafés and retaurants if you’re in need of a stop before moving on or if you just want to sit and take in the Arena from a close distance. 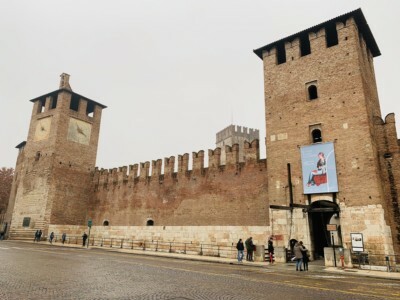 You can then take Via Roma towards Castelvecchio, a small castle by the river. You enter through the drawbridge at the side of the road and from there walk into a small courtyard and garden. 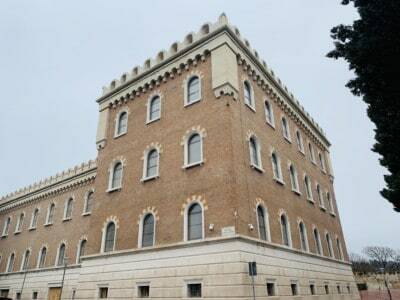 The Castelvecchio Museum is also here – an art museum that you can visit for €6. 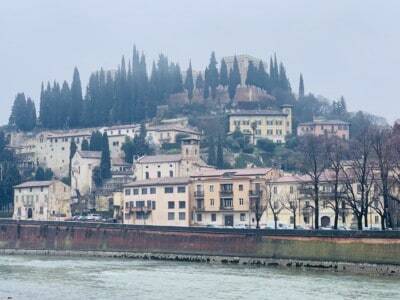 Other than this, a visit to the castle is really a quick stop and an opportunity to wander across the bridge that strides the Adige River. 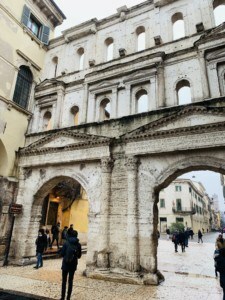 From the castle, follow Corso Cavour up the city gate, La Porta Borsari; this is a magnificent limestone gate which is nearly 2,000 years old and was once the city’s main entry point. Head further up Corsa Porta Borsari (make sure you look up at some of the beautiful buildings lining the street) and turn off at Piazza delle Erbe. This is another potential coffee or lunch stop. The plaza has a number of cafes and restaurants; these have outdoor seating which in warm weather would be a perfect spot from which to watch people perusing the small market located in the square next to the fountain. 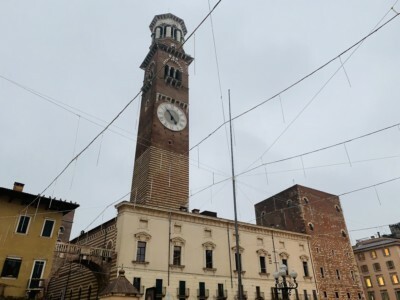 Look up and you’ll also see the Torre dei Lamberti, a Romanesque style tower dating back to 1172. It is 84 metres high and has 368 steps to the top (you can also take an elevator). 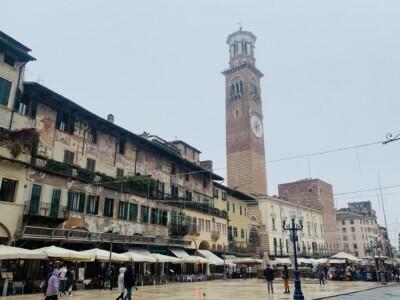 After leaving the tower, make sure you pop into Piazza dei Signori, through the stone archway on a side street off the square. 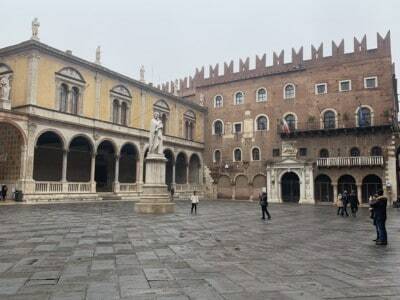 I loved this wide open square with its statute of Dante. 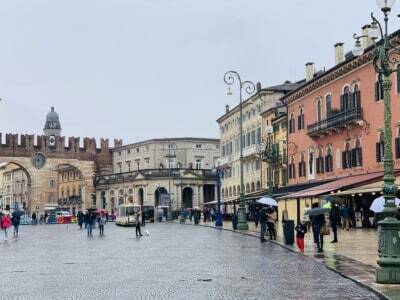 Maybe it was the fact that it was deserted (something I discovered is pretty rare in central Verona) or the elegant buildings framing the square. 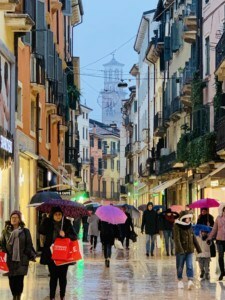 If you then fancy a spot of shopping, take a stroll down Via Mazzini – an attractive street with some really quite elegant shops on it. I’m sure you could spend a small fortune here if you wanted to, or else shop for some souvenirs to take home. When you reach the end of the street, you will be back near the Arena, where you might want to stop for the day and have some early evening cocktails whilst planning your evening meal – there’s certainly no shortage of eateries, as you’ll notice as you wander around. 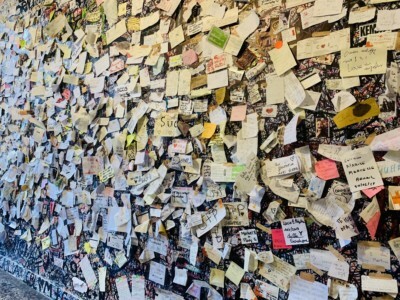 Personally, I’d start my second day by going straight to Casa di Giulietta (Juliet’s Balcony) – but my advice would be to get here as early as possible. 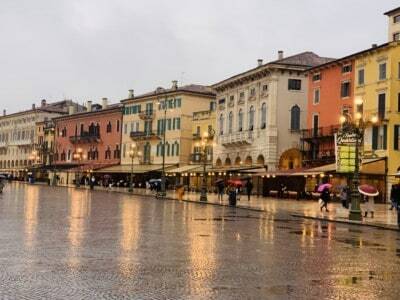 Despite Juliet being a fictional character, this is the place where she is said to have lived, its location – on Via Cappello – being linked to the Capulet family in Romeo and Juliet and Verona one of the settings for Shakespeare’s famous play. Not surprisingly, it’s a tourist draw and can get very crowded. Going early or late in the day improves your chances of being able to soak in the surroundings with less people around – and importantly, snapping some pictures tourist free. Take the opportunity when it’s quiet to step under the archway, gaze up at the famous balcony and look at the bronze statue of Juliet in the courtyard; make sure you stop for a few moments to gaze at the walls of the archway which are littered with post-it notes with messages of love scrawled across them – Verona’s version of love locks on a bridge I guess. 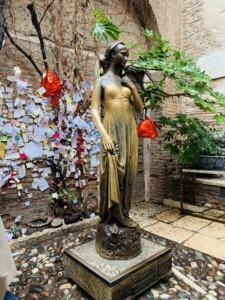 If you have a bit more time, there is also a small museum in Juliet’s house (entry €6) which is worth seeing. Inside, there are various rooms where you can admire the art and period furniture, as well as read various excerpts that have been reproduced from Romeo and Juliet. 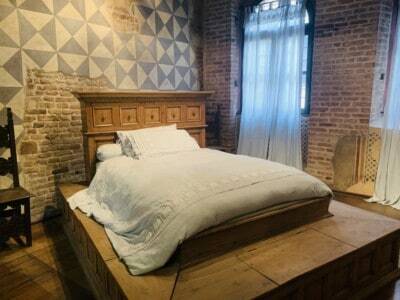 The bed that was used in Franco Zeffirelli’s 1968 version of the play is also on display. 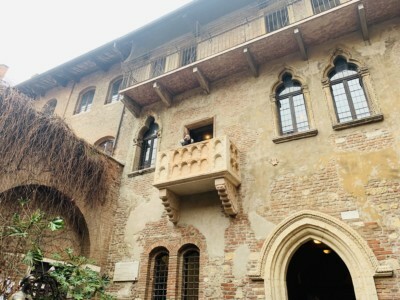 Last but not least, make sure you stand on the balcony and peer out over the small courtyard below as Juliet might have done – this is a popular place to take pictures. Not far from Casa di Giuletti and next to the river is the Duomo. You can walk here through the city’s streets (head for Ponte Garibaldi and then veer off to the right before you cross the bridge), or by going towards Ponte Nuovo and then following the river around. This is a huge – and stunning – Catholic cathedral that is definitely worth the €3 entrance fee (and includes a handheld audio guide that will give you more information on the building’s history and design as you walk around). The interior is stunning. 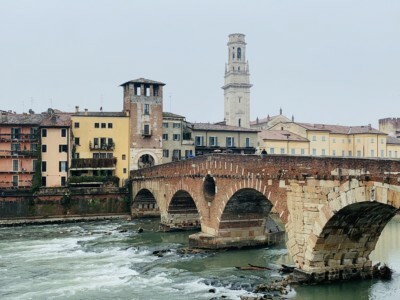 After leaving the Duomo, make your way to the Ponte Pietra, the oldest bridge in Verona. There are a few cafes and restaurants here where you could stop for coffee and/or lunch. And cross the bridge you must because only then when you turn around and look back will you appreciate how beautiful it is. The bridge has a string of arches through which the choppy water flows and is a mix of coloured stone. You step onto the bridge via an archway in a tower on the side of the river. 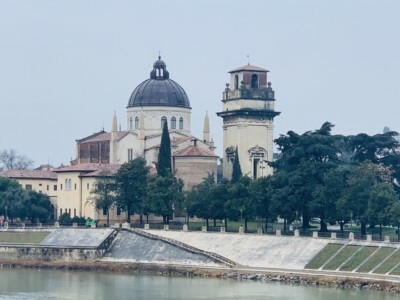 From this vantage point, you can look across to the opposite bank where you will see colourful Veronese buildings sitting below tall cypresses on the hill above, and a castle perched on the summit. To the left, you’ll also see the Duomo looming large a little further down the river. I spent quite a bit of time standing by the bridge taking in the panoramic views of the city and bridge. This was one of my favourite spots in Verona. 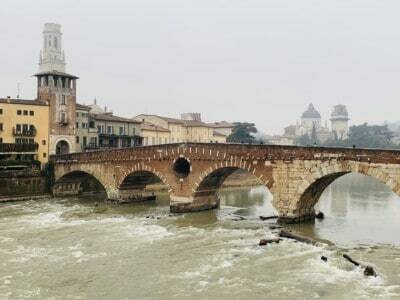 Once you’ve crossed the Ponte Pietra, you’re then a stone’s throw away from the Teatro Romano (Roman Theatre). Predating the Arena, only ruins now remain on the side of the hill, along with an archaeological museum. I didn’t go into either but reviews say this is worth doing. I was running out of time on my trip, so decided instead to climb further up the hill to Castel San Pietro (I chose to take the stone staircase up, but you can also take a funicular to the top). At the summit, two things are striking: first, how modest the castle is – it’s really a rather plain building surrounded by a pathway and it doesn’t appear to be a building that you can go into; second, that the views over the city are incredible. 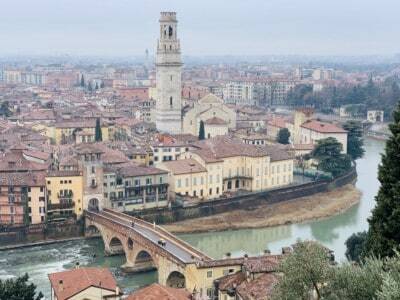 You can see right over the river in both directions and back across the city and a different view of the Ponte Pietra bridge. Although you may initially be slightly disappointed by the castle, you definitely won’t be disappointed by the views you are afforded. 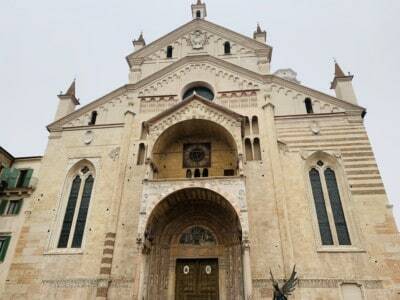 If you’re on a short break to Verona, this may be the end of your trip. If so, take a leisurely stroll down from the castle, back across the bridge and into the city centre. Then if you have time, have one last stop in one of the wonderful eateries – be that a final plate of pasta, torta, gelato or vino. 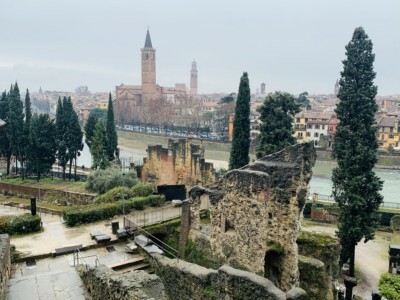 This is a perfect opportunity to reflect on your time in a delightful Italian city – I hope you find Verona as enchanting as I did.